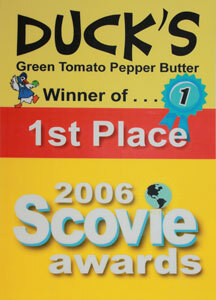 Our Green Tomato Pepper Butter was First Place winner of 2006 Scovie Award and Third Place 2008 Winner! You can find Duck's products in many fine boutiques or order directly from us. Don, Donna, and Bruce will be happy to answer any questions you have. Just give us a call or you may email your order. We ship Fed Ex direct to your door. You are charged what Fed Ex charges us for shipping. All of our product choices and pricing are below. Retailers please inquire about wholesale pricing.